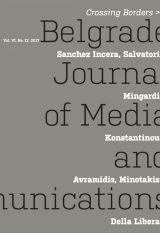 Belgrade Journal of Media and Communications is the official magazine of the Faculty for Media and Communications, Singidunum University, Belgrade, Serbia. The journal is published biannually and oriented to the political decoding of discursive formations. Our aim is to produce a series of special issues dedicated to crucial questions regarding “compulsive discourses” on the end of history, politics, geography, as well as on post-humanity, postmodernity and post-secularism, among others. The small academic community gathered around the Journal represents a unique network, and a platform for absolute difference and endless multiplicity. We are convinced that our communications and cooperation can optimally function from the standpoint of the pure communicability of difference. Therefore, we promise to promote words, discourses and texts in accordance with their own pure alterity, mediality and communicability. We will try to reconnect and renew lost relations between the local academic community and its international partners and friends. A new impulse - but for which Europe?